How to win in baptized-TAC-toe 5 in a row"
"Tag" is a logical game, which purpose is to lay down in a square gorbochku figures-knuckles from 1 to 15. To move only in one plane. 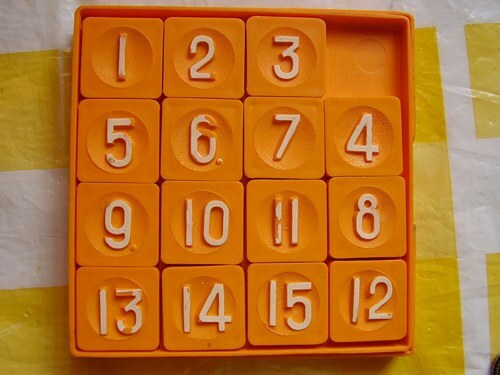 Shuffle the numbers in the box. In a square plane of dimensions 4 by 4, you should have fifteen tiles with numbers and one empty space to move around. Try not to remember what and where you moved. So the game does seem interesting. If you are a gambler, then give the tag to the child for five minutes. He'll do the job in good faith. Start to build the first row with the knuckle 1. Detach the upper left field and gradually move back to the unit. At this stage, no matter what knuckle you will go to the bottom row and which are at the top. Their placement is not yet time to change, so all attempts to put the bottom row can be unsuccessful. Complete the entire first row. Knuckle 1, 2, 3 and 4 must be in their seats. The logic is the same free field you are interested in the knuckles and moving the adjacent numbers, pick up the desired chip. To build the first series is very easy because you have plenty of space to move around. Complete the second row. Knuckle 5, 6, 7 and 8 are similarly arranged from left to right. It's easy enough, because in the preparation of the two upper rows of the lower of the knuckles is not taken into account. The way each piece can be longer because you have already occupied the top row. At game speed, at this stage it is necessary to calculate which way would be shorter, and how much it will affect the location of other chips. Put the knuckle 9 and 13 into place. Further, they do not move. All movements use the remaining six positions. This is enough to put a "tag". Move into place the knuckle 10, 11 and 12. Do not attempt to build bottom line, as a rule, with proper movement of the bones 10, 11, 12 remaining pieces will fall into place. Sometimes there may be a situation that the last two knuckles 14 and 15 are on the contrary. There are many options for the layout of the "tag." For example, instead of 9 and 13 to put the first 9 and 11. When you get tired of a simple game of tag, you can try to play for time or points.